Däck, färdiglimmade, Road Rage Street Tires Mounted on Desperado Black Wheels for 1:16 E-REVO, 1 par. 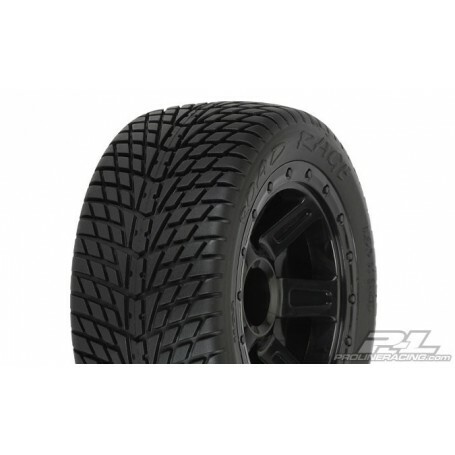 This is a pair of Road Rage Tires Mounted on Desperado 2.2 Black Wheels for 1:16 E-REVO. Looking for more stability and traction on the street without added strain on your drivetrain? The Road Rage tires mounted on Desperado 2.2 wheels give you just that all in a lightweight package. Stability is achieved by a ½ wider stance on each side of the vehicle with the new Desperado wheels. your little E-REVO® with Pro-Line proprietary street-shredding design and high performance M2 (Medium) rubber compound. Pro-Lines highly anticipated new 6-spoke Desperado wheel will make your truck the toughest looking one on the block. in bead-loc ring for an awesome scale look. Tires Mounted on Pro-Line Desperado 2.2 wheels today!